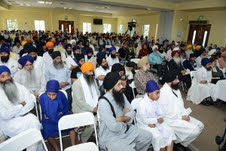 (USA)- Under the aegis of Guru Granth Sahib several seminars on the Heritage of the Khalsa and Amrit Banis were organised. 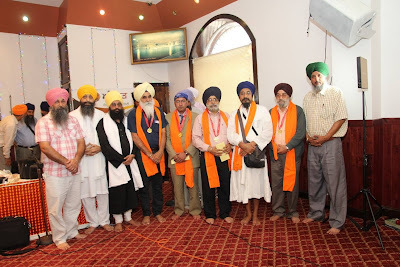 The first was on July 27, 2013 at Gurdwara Sahib San Jose, California. At the outset it was emphasised that Guru Granth Grant Sahib is the only Guru of the Panth but Sri Dasam Granth Sahib is from divine pen of Guru Gobind Singh Ji and will remain integral part of the Khalsa fabric. The apt attention and silence with which the audience listened to the renowned scholars showed their urge and desire to know and grasp the glory of Guru Granth Sahib Ji and the scriptures of Guru Gobind Singh Ji. The seminar started with a phone message of Giani Gurbachan Singh, Jathedar Sri Akal Takht Sahib where he reminded that there are people trying to spread misinformation about Gurbani and especially Dasam Granth. The need of the hour is to bring out the truth to the Sangat.The Hukumnamas of Sri Akal Takht Sahib of 2006 and 2008 were reiterated which gave sanction to these seminars to be undertaken. Dr. Harbhajan Singh from Punjabi University Patiala, and an authority on Gurbani, gave a lecture on the authorship of Sri Dasam Granth. He mesmerised the audience with the purpose, intent and motive of the writings of Sri Dasam Granth. He reeled out instances and references from the scripture to show how all the banees of Sri Dasam Granth are interconnected and can only be from one author. He gave details about the concept of kaal and akaal in Sri Dasam Granth. He was candid in giving details of Charitropakhyan and gave instances from the scripture. His book was well received by the sangat. Gurcharanjit Singh Lamba. Dr Jodh Singh, Dr Harbhajan Singh, S Gurinder Singh Mann and Gyani Sher Singh answering questions from the sangat. Gurinder Singh Mann a scholar from the UK who has done commendable work on the sources and different Birhs of Dasam Granth gave details of his research. In his presentation he showed different editions of Dasam Granth found at different places and their relevance.He was praised for explaining how relics of the Khalsa were important sources of Sikh History. Describing a a rare copper plate, the swords of the khalsa he showed how Dasam Bani had been inscribed onto material items. 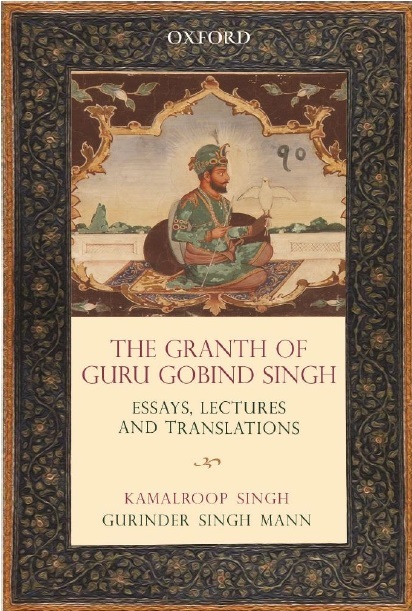 He closed his ground breaking lecture with how the British had viewed the Sri Dasam Granth Sahib including his description of the first Sri Bachitra Natak English translation. His book Sri Dasam Granth Questions and Answers sold out within the first few hours of the programme. 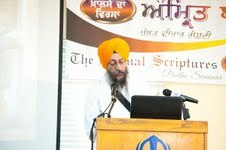 Dr Gurtej Singh, Organiser of the Programmes. The whole program was conducted by Dr. Gurtej Singh who noted that the organizers of “Khalsa Da Virsa – Amrit Baani” seminar decided to invite scholars who could shed light on the Sikh scriptures and try to clear doubts caused by the overwhelming negative parchar . The main focus of this seminar was that the Gurbani of our eternal Guru, Sri Guru Granth Sahib Ji is “Dhur Kee Baani’ or the Revealed Word, and the saroop of Sri Guru Granth Sahib Ji that we have today is the authentic and is the same as compiled by Guru Gobind Singh Ji at Damdama Sahib. The other main focus of this seminar was to preserve faith in “Khande de Pahul”, our Ardas, and a Sikh’s daily Nitnem Banis; which are from Sri Guru Granth Sahib Ji and Sri Dasam Granth. 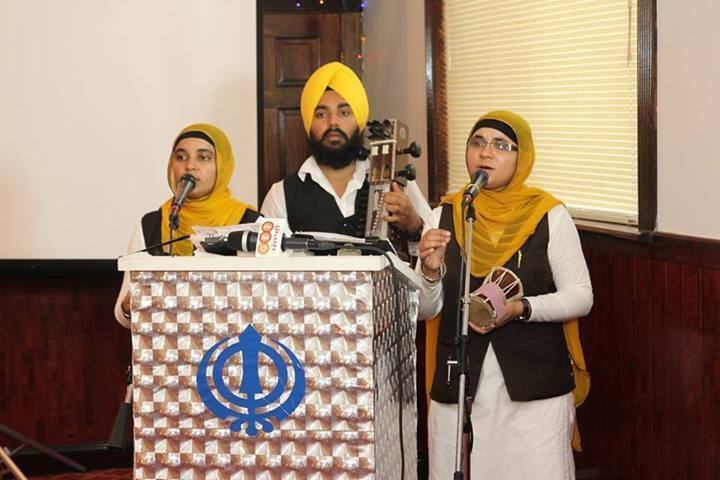 The event was broadcast live on Sikh Sangat Radio and San Jose Gurdwara Websites. According to Sikh the Sangat Radio team, " there was over 2000 people watching and listening live to the programme at it's peak." This motive was achieved to the full as the doubts were dispelled and faith was strengthened. So much so that those who had some misgivings were saying openly that now they realize how they were misled by unscrupulous pseudo scholars. An additional programme was held at Riverside Gurdwara, Los Angeles. The theme was again based on the San Jose programme. The participants were Dr Jodh Singh, Dr Harbhajan Singh, Gurinder Singh Mann. The programme was conducted by the Gurpreet Singh.The programme was well received by the sangat.The scholars were later questioned on the Sri Dasam Granth Sahib to which they gave befitting replies. The Sikh scholars also appeared on the TV channel GetPunjabi. The scholars were posed questions by host Gurcharanjit Singh Lamba. The themes covered the importance of Dasam banis and the false allegations made by writers on the deeper meanings on Guru Gobind Singh's Granth. The Seminar was held in Queens New York. The organisers wanted to ensure that the east coast of America was also witness to the wealth of knowledge held by the Speakers. The programme commenced with the Dhadi Jatha Baddowal Walian Bibian. The Gurdwara President Sirdar Hardev Singh explained there was a dire need for this seminar as all Sikhs needed to follow the Sikh Rehat Maryada, the resolutions of Sri Akal Takht(on Dasam Granth) and the bani of Guru Gobind Singh. Dr Gurtej Singh again introduced the speakers and gave a inspiring start by explaining there was no difference in the Guru's thoughts and ideas as reflected in both Sikh Scriptures. Some highlights included Dr Gurcharanjit Singh Lamba stating that the key concepts and words like 'Ardas', 'Wahe Guru Ji Ki Fateh', were all derived from Sri Dasam Granth Sahib. Gyani Sher Singh explained the role of Shastars and Sri Dasam Granth Sahib as well as giving explanations of some of the Charitras within Charitropakhyan. Dr Harbhajan Singh explained the role of Kharag Singh within Krishna Avatar and the recent views that the Granth was created by the British and Brahmins was not only laughable but was putting the religion into disrepute. Dr. Jodh Singh gave interesting observations on ho the creation of Dasam bani was to uplift the Sikhs and make them into the Khalsa they are now. S. Gurinder Singh Mann showed how Dasam Bani from the time of the Tenth Guru formed a pivotal part of the Khalsa, and hence the debates on the Granth were a modern creation which had no basis in history. The event was televised by Getpunjabi TV station. The speakers were appreciated by the event organisers and the Sangat alike. The participants were honoured with gold medals at the end of the event. Overall the programmes were a major success and sent a strong message to the individuals who were spreading hate and questioning the Amrit Banis and the status of Sri Dasam Granth Sahib. The Seminars stated that the attacks on the foundations of the Khalsa were generated by non scholars and part time writers who had not undertaken any research on Guru Gobind Singh's Granth. It was also confirmed that that further programmes would be scheduled on a larger and grander scale in the future.